This blog post shines a spotlight on the Norfolk Punt, as this weekend is the Norfolk Punt Championships. 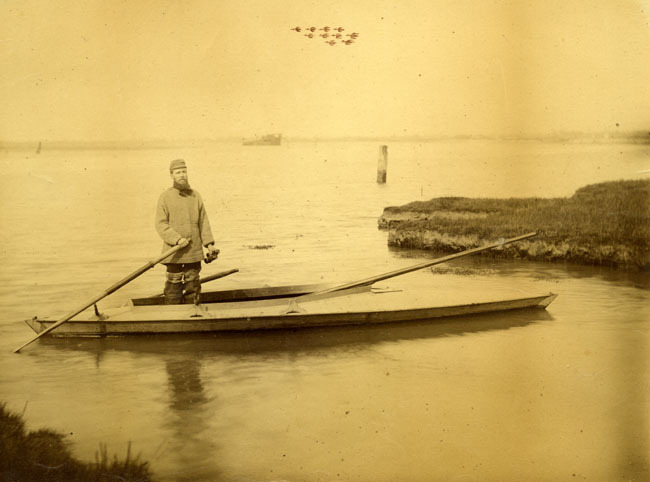 The Norfolk Punt was originally a flat-bottomed boat used on the Broads in the nineteenth century for fishing and shooting wild fowl. Hunters paddled, ‘quanted’ or rowed the boat through the water, with the fowler lying prone in the bottom of the punt with a gun at the ready, to approach duck feeding on the mud flats or sleeping on the water. Later, the punters began to install a basic mast and sail, to take advantage of the wind, and from this, quite by accident, developed the later class of fast racing dinghy. Today, the Norfolk Punt is a recognised, world-class sailing dinghy, which represents an extraordinary transition from simple local function to racing against the best in the world. The Norfolk Record Office not only has papers relating to the Norfolk Punt Club, formed in 1926, but also papers of Gerald Sambrook Sturgess, Commodore of the Club between 1938-47, and Chairman of the Racing Rules Committee of the International Yacht Racing Union between 1973-78. The object of the Club was to ‘preserve and improve the traditional type of punt and to encourage competitions in quanting, rowing and sailing of the same’. A rudimentary mast and lug-rig sail were set up to take some of the effort out of rowing long distances and the hunters found the punt could sail surprisingly fast. It was steered by just one oar off the back, but there was no keel or lee board to keep the boat from slipping sideways over the water. The overall length of the punt was between 16 and 22 feet, and the sail area was restricted to 8 square feet per foot of length. Various modifications were made throughout the twentieth century by such famous designers as Uffa Fox and Phil Morrison, and today the Norfolk Punt is recognised as one of the fastest single-hulled boats ever built. It achieved 13.8 knots at the world speed trials at Weymouth Harbour in 1978, faster even than a Flying Dutchman. Many of the early punts have been lovingly restored, and some have been modernised, with the installation of carbon masts and spars, trapezes and composite sails above their old clinker hulls. Each has a number, like a limited edition print. There are still many of these old clinker-built vessels around and, whenever they race against their modern counterparts, they are given a handicap, to allow even competition. Mr Sambrook Sturgess (1901-91), who lived in The Close, Norwich, was one of East Anglia’s best known yachtsman, author of sailing books and expert on sailing rules. He had an ‘encyclopaedic knowledge and memory of the case law relating to racing rules’ and received an OBE for his services to yachting. His edition of ‘Yacht Racing’ (1947) is considered to be the best authority for many club racing committees. 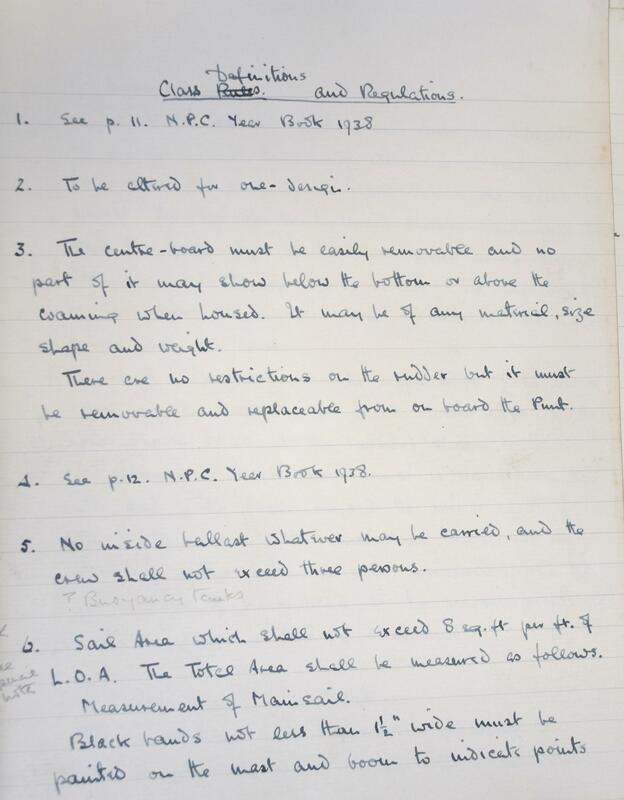 Quotations for costs of supplying sails to the Club, 1937. Catalogue entry. 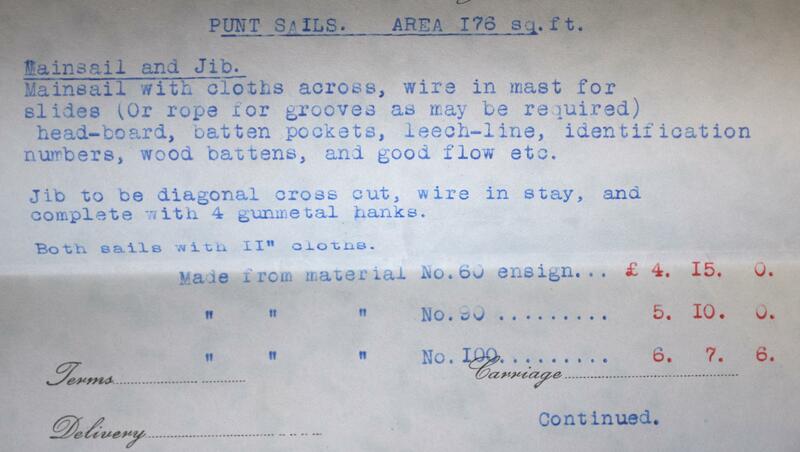 The Norfolk Record Office has letters dated August 1937 from three separate yacht chandlers to Mr Sambrook Sturgess giving quotes for sails for the Norfolk Punt Club, including samples of the proposed material to be used. The cost ranges from £4 15s to £8 16s for a sail of 176 square feet, excluding labour. This entry was posted in Snapshots from the Archive and tagged boats, broads, fishing, letters, OBE, Phil Morrison, punt, racing, sailing, Uffa Fox. Bookmark the permalink.